The digital and tech industries offer incredible careers for young people with good salaries and benefits. Digital and tech knowledge and careers are no longer confined to geeky stereotypes. Anyone can have a successful digital or tech career, working for any number of organisations; everything from cyber security for fashion brands to marketing for banks. 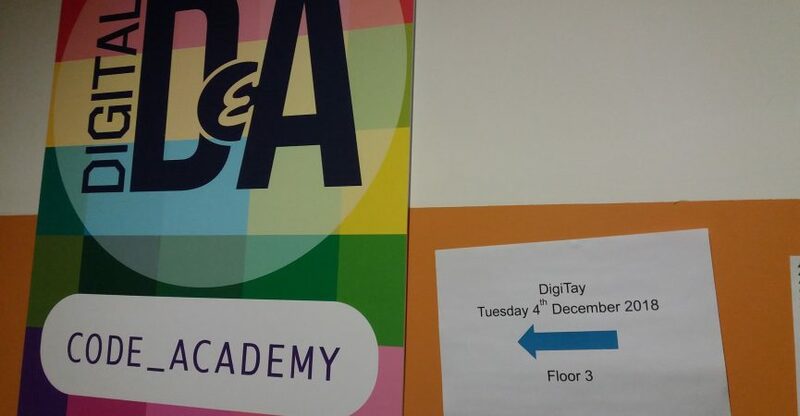 DigiTay was an opportunity to highlight this message to teachers, parents and young people. Developing the Young Workforce Dundee & Angus, in partnership with Dundee & Angus College brought together two international digital companies, based in Scotland, to share their experiences and discuss what they look for in an employee. Alix Foreman, former Modern Apprentice, currently working as a Search Engine Optimisation Specialist for MTC Media and current Graduate Apprentice Rowan Whitton working for Cortex Worldwide as a Junior Web Developer, spoke about their personal journeys and what the apprenticeship programmes had brought to them. Information like this is invaluable, as it is relevant and contextualised and most importantly completely honest. Young people, parents and teachers can find out general information about apprenticeships, careers and industries on the internet, but hearing personal experiences and being able to ask questions makes it so much more impactful. If you missed attending DigiTay in person you can still watch the talks via the recorded livestream, click here for the link. Use this to learn more about the industry and the pathways available, show it in classrooms and to young people to broaden their horizons and give them relevant information. This is the second year that DigiTay has run and the attendance was even better this year. While parents and teachers were listening to and asking questions of the professionals the children and young people were able to take part in a free code academy session, with augmented reality, robots, scratch, virtual reality and more. Employers – If you would like to be involved in events like this, or engage with young people, to promote your industry or careers you have available get in touch with the DYW Dundee & Angus team. Teachers – We have highlighted some of the huge range of resources available to you to make learning more engaging, check out the resources section on our website. If you are keen to get employers involved in your classroom to provide context and relevance take advantage of Marketplace and Founders4Schools or get in touch with the DYW Dundee & Angus team.